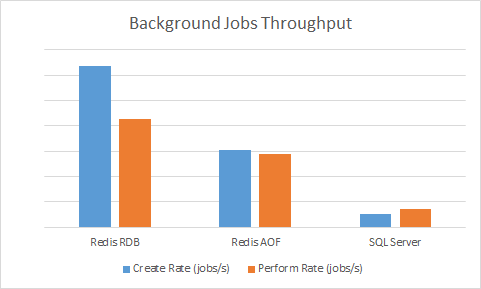 Hangfire with Redis job storage implementation processes jobs much faster than with SQL Server storage. On my development machine I observed more than 4x throughput improvement with empty jobs (method that does not do anything). Hangfire.Pro.Redis leverages the BRPOPLPUSH command to fetch jobs, so the job processing latency is kept to minimum. Please, see the downloads page to obtain latest version of Redis. If you unfamiliar with this great storage, please see its documentation. Binaries for Windows are available through NuGet (32-bit, 64-bit) and Chocolatey galleries (64-bit package only). Multiple Redis endpoints are only supported in Redis Cluster configuration starting from Hangfire.Pro.Redis 2.1.0. You can’t use multiple detached masters or Redis Sentinel configurations. Please read the official Redis documentation to learn how to configure it, especially Redis Persistence and Redis Administration sections to get started with the fundamentals. The following options should be configured to run your background jobs smoothly. These values are default for on-premise Redis installations, but other environments may have different defaults, for example Azure Redis Cache and AWS ElastiCache use non-compatible settings by default. # processed multiple times due to connection was closed. # NOTE: This setting is only required for Hangfire.Pro.Redis 1.x! # nor expiring keys are evicted before the expiration time. After installing the package, a couple of the UseRedisStorage extension method overloads will be available for the IGlobalConfiguration interface. They allow you to configure Redis job storage, using both configuration string and Hangfire-specific options. In .NET Core you need to use IP addresses instead, because DNS lookup isn’t available in StackExchange.Redis for .NET Core. You can use a single endpoint to connect to a Redis cluster, Hangfire will detect other instances automatically by querying the node configuration. However, it’s better to pass multiple endpoints in order to mitigate connectivity issues, when some of endpoints aren’t available, e.g. during the failover process. This will bind all the keys to a single Redis instance. To be able to fully utilize your Redis cluster, consider using multiple JobStorage instances and leveraging some load-balancing technique (round-robin is enough for the most cases). To do so, pick different hash tags for different storages and ensure they are using hash slots that live on different masters by using commands CLUSTER NODES and CLUSTER KEYSLOT. Database null Redis database number to be used by Hangfire. When null, then the defaultDatabase option from the configuration string is used. InvisibilityTimeout TimeSpan.FromMinutes(30) Time interval, within which background job is considered to be still successfully processed by a worker. When a timeout is elapsed, another worker will be able to pick the same background job. Prefix hangfire: Prefix for all Redis keys related to Hangfire. MaxSucceededListLength 10000 Maximum visible background jobs in the succeeed list to prevent it from growing indefinitely. MaxDeletedListLength 1000 Maximum visible background jobs in the deleted list to prevent it from growing indefinitely. SubscriptionIntegrityTimeout TimeSpan.FromHours(1) Timeout for subscription-based fetch. The value should be high enough enough (hours) to decrease the stress on a database. This is an additional layer to provide integrity, because otherwise subscriptions can be active for weeks, and bad things may happen during this time. This is the old version of Redis job storage for Hangfire. It is based on ServiceStack.Redis 3.71, and has no SSL and .NET Core support. No new features will be added for this version. This version is deprecated, switch to the new version to get the new features.